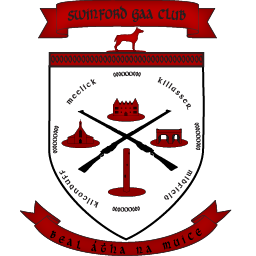 After a dramatic draw a few weeks ago Swinford and Kilfian met again in the Junior Championship Relegation Playoff in Ballina at Sunday Lunchtime. This writer was late to the game, coming from a very good Under 15 League match at Robert McCallion Memorial Park between Swinford and Hollymount-Carramore. The game was three apiece when I arrived at James Stephens Park, Ballina with all Swinford scores coming from the dead ball of Adrian Forkan. Kilfian twice went back in the lead in the closing stages of the first half only to be leveled both times by Adrian Forkan with a point from play and another free. So at half time there was nothing to split the teams at 0-5 each. Kilfian went into a two point lead before Pearse Walsh got one back but from there Kilfian took control of the game and save for another Adrian Forkan point they scored 2-3 without reply. The Swinford team didn’t give up and two more points from Adrian Forkan and a lot of hard work that went without reward they kept battling. Unfortunately Kilfian got another goal before Jason McLoughlin got a consolation goal near the end to finish the game Swinford 1-9 Kilfian 3-10. Kilfian retain their Junior status for next year while we enter the last chance saloon in the coming weeks to retain Junior A status. With a number of regular players missing it was a great effort by Swinford.